Tick bites on humans could be harmful and dangerous when you don’t give the right attention to it. Assessment and proper care is vital because bacterial infection could take place. The most number of bites, about 80%, are reported between May and September when ticks are very active. This is the time when the chances of contracting tick bite related diseases are high. You might want to be extra guarded especially if you are one for long walks in the woods or going to places where tick presence might be common. Lyme disease is one of the most dreaded infections caused by tick bites. It is a condition that affects the joints and the skin and was discovered in the late 70’s. 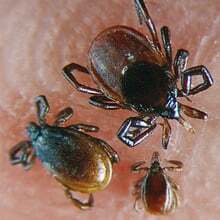 It is transmitted as a tick bites on humans and spreads the Borrelia bacteria in the process. The disease is widespread in Europe and North America and in other countries with mild temperature as ticks don’t thrive in sunny regions. If you don’t belong to these regions, you may stop worrying about Lyme disease but NOT about other infections due to tick bites. Do not panic. Most bites are harmless and the result may be dependent on the type of tick infection. Observe a bite for three to four weeks. The ill-effects could take that long to be noticeable. When a tick bites on humans, promptly but gently remove a tick attached onto your skin. You don’t want to squeeze tick juices which may be injected into your blood. Use a pair of tweezers to easily grasp the pest and pull it off of your skin, its body and head as intact as possible. Never treat the bite site with alcohol or ether. The tick could increase its secretion of infected saliva and make matters worse. Make sure you seek appropriate treatment if the bite condition is more than you can handle. The needs for professional treatment following a bite vary and often are a case to case basis. If you are able to extract the tick from your skin, have it checked at the clinic for an assessment so that proper course of action may be taken. In most cases though, bites may bring no harm and the redness goes away after some time. While a tick bite is not always serious in most cases, there are some that may require preventive treatments such as the use of antibiotics. For that reason, the Infectious Diseases Society of America or IDSA states that professional help may be needed especially if a tick has been attached on the skin for over 36 hours and the tick is an adult, more so if it’s a deer tick. How bloated the tick appears may help determine the amount of time it has been attached. Infection may be prevented if an antibiotic is administered within 72 hours. Other tick-borne infections like Lyme disease may still be treated with the right antibiotics even after some time from exposure. The effects of tick bites on humans differ that some people fail to identify when a Lyme disease is developing mainly because of lack of education. A significant characteristic of the disease is a noticeably growing redness on the site of the bite. It can grow up to 8 inches in diameter with the edges appearing like rows of deep red rings, the center a little paler. The lesion may be accompanied by a burning and itching sensation. Sometimes a simple rash that follows after a tick bite can be mistaken for a Lyme disease but clears in less than 48 hours. Lyme disease, on the other hand, could take a week to a month before symptoms appear hence the advice to observe a bite for that given period of time. To avoid tick bites on humans and the ill-effects that could bring not only discomfort but health troubles, take adequate precautions. Because ticks are often found in bushes and in the woods, make sure to put on protective clothing if you plan to venture into these areas. Pets can carry ticks too so monitor tick presence on a regular basis so you can quickly get rid of them before they multiply.